Some days, our trip to Chile feels like a dream. That first day in Santiago, when adrenaline and frothy cappuccinos powered our every move through the bustling streets and fish-filled market and rambling parks. Or our boat ride to see the penguins, those fancy birds meditating under the dim Patagonian sun. Or lazing by the pool of our Airbnb in the posh Las Condes neighborhood. Or, my personal favorite, climbing the intensely steep hills of Valparaiso, and arriving at the source of the beautiful music we heard — a twelve-piece band casually practicing in a garden as pedestrians strolled by. Ben and I are, what I’ve dubbed, “lazy attachment parents,” the types of parents who never planned to be co-sleepers, extended nursers, or 24/7 baby-wearers. Instead, we fell into these habits simply because they made life easier — and we liked doing them. So, though on our trip to Finland, our Airbnb host generously purchased a pack ‘n play for our then four-month-old, I’m pretty sure that Little One spent a grand total of one hour there, and the rest of the time in our bed. In Chile, co-sleeping wasn’t an option, though. Little One was down to two breastfeeds a day, and I wasn’t about to start nursing through the night again. This meant that Little One wasn’t interested in sleeping with us. The pack ‘n play gave Little One a safe and consistent spot to sleep, where he slept mostly uninterrupted through the night. It also meant that we didn’t need to limit ourselves to hotels with cribs. And, because Ben lugged the 15-pound bed throughout Chile, I really couldn’t complain. Thank god for Airbnb or else we’d be those weird parents staying in hostels, sharing stories about baby travel with teenage backpackers. Airbnb offers good accommodations for a quarter of the price that you’d spend on a hotel room. While Chilean hotel prices (that offered cribs) started at $100+, our Airbnbs ranged from $50-$75 per night. Plus, each Airbnb apartment that we booked came with at least two rooms, which meant that Ben and I didn’t need to tiptoe around once we put Little One to sleep. Other benefits included on-premise laundry machines — a major plus for parents with babies who don’t like to wear bibs, as well as locals to offer tips and fawn over Little One. One word of caution: don’t trust it when an Airbnb claims that it’s “baby-friendly” or “family-friendly.” Do any parents work at Airbnb, or is it a Silicon Valley company that only employs young single people? One of our Airbnbs had a homemade bookcase with nails sticking out (Little One was enamored), and a balcony with railings that were a little too wide for comfort. Yikes. Little One explores his musical side at our Airbnb in Valparaiso. We literally packed like rockstars. No, that’s not right. We packed like people flying on Spirit Airlines, who wanted to pay for as little luggage as possible. Except that we were flying LATAM Airlines, and didn’t have such limitations. We just didn’t want to schlep around so much STUFF. After all, we needed to take a stroller with a snap-in carseat, a pack ‘n play, and two carry-on backpacks. Another piece of luggage would’ve been too much. So, Ben and I packed as little as possible, and allotted the bulk of the space to Little One’s clothing and toiletries. Of course we banked on doing laundry a few times — which we did, so we were often able to wear clean clothes. Babies get sick a lot — sometimes as much as once a month. We knew that on a two-week trip, something at some point would go wrong. In addition to buying travel health insurance (we used Allianz), we also decided that we’d feel much more comfortable traveling to a developed country. Chile is one of 35 countries in the Organisation for Economic Co-operation and Development (OECD), which makes it one of the wealthiest countries in the world, and it’s the richest country in South America. So we figured that the medical care would probably be alright. As luck would have it, Little One woke up one day with a very gooey eye. I called his Manhattan doctor, who advised us to head to a medical clinic. One-and-a-half hours later, Little One had not only been seen by a pediatrician — who spoke some English — in a lovely and clean clinic in Valparaiso, but we’d already filled his prescription! And then we were back on schedule. Oh, and all for a grand total of $110, $18 of which the insurance company reimbursed. Random, I know. But, all in all, the experience involved minimal time and stress. While preparing for my first international flight with Little One from Tel Aviv to New York, a friend advised me to bring lots of toys. “But he’s four months old,” I thought at the time. “The only thing he really needs is a breast that spouts milk.” Fast forward to 14 months, and Little One is always ready to play. At home, Little One’s room is filled with toys big and small, but with one suitcase, we needed to choose wisely. The best things we packed were Tegu magnetic blocks, which came in a small pouch. These were endlessly entertaining, and, because they are magnetic, they were exceedingly hard to lose. Little One played with them all over Chile — in airplanes, boats, on at least a dozen restaurant floors, in five Airbnbs, in parks, along the shore, everywhere. And we returned home with each piece. Of course, once back in our apartment, we promptly lost them. Like many new-ish parents, Ben’s and my conversations often revolve around what Little One eats. What’s he eating that has protein? Did he have that snack? Did you remember to cut the grapes in half? In Chile, our lean Little One exercised his love of fish — chowing down Chilean sea bass or salmon at least once a day. We also made daily trips to the supermarket, where we picked up staples that would keep him satiated throughout our busy trip — avocados, bananas, canned beans, bottled water, and these delicious little wafers that he’d raze through. We only chose fruits and vegetables with peels, to avoid stomach issues that could come from ingesting water-washed skins. We got to know Chilean supermarkets, always weighing our produce and bread before checking out, and felt, at least for a few minutes, like locals. One reason that I was excited to become a mother was that I knew that a baby would help me refocus my energies. I’d spend more time doing the essentials, and less time trying to achieve unclear goals. In Little One’s early days that meant holding him for hours every night as he bawled his eyes out. Nothing could calm him down, so all we could do was be there for him. During our trip that meant making sure that, first and foremost, Little One was happy. That meant giving him lots of time to crawl around and play on the ground. Little One wouldn’t help us see every site, but he would force us to slow down and relax. And he had to remind us that he needed tons of downtime every single day. Around day six, we finally got the message. Truthfully, those times when we just lazied around — spending a morning hanging out at our Airbnb, an afternoon with a pail and shovel on the Vina Del Mar beach, or a few hours lying in the park next to the poet, Pablo Neruda’s Valparaiso-based house, were the best. For better or worse, Ben and I are explorers, witnesses, travelers, and pilgrims, constantly thinking about the next museum, park, church, or cafe. And we’ve always shied away from being vacationers. But, on this trip, we really did need a vacation. Imagine giving birth, moving across the world, having a major surgery, selling a business, and starting a new career all in one year. Little One may not have been aware of all of these crazy things, but he did force us to chill out in Chile. That pail and shovel were the best $4 we spent on the entire trip. Every time we chose to spend extra money on a better form of transportation, we never regretted the decision. Let me put it this way — what sounds better to you: getting off of a three-and-a-half-hour plane ride and then taking a taxi to a one-and-half-hour bus ride to another taxi, or springing for one taxi directly to your destination? In our pre-baby days, we would have gone with the former, but with a baby, the less process there is, the better. Rent that car! Choose the plane ride over the ten-hour train ride! Book that tour instead of navigating a national park on your own! Take a five-minute Uber instead of a 30-minute walk in the rain! Most of this, we learned the hard way. We chose LATAM Airlines for one reason: it was cheapest. And we were thrilled with the service. First of all, people traveling with babies cut every single line. We checked in without waiting, breezed through security, and boarded the planes first. Apparently, parents are first class in Chile! Another unexpected benefit for us, but probably not for LATAM, was that each of our international flights was only half full at best. This meant that there was tons of room for Little One to roam around, cruise, and throw stuff. During our endless aisle walks, while we tried to lull Little One to sleep, we didn’t get in people’s ways. Basically, flying bliss means flying on empty flights. When I shared our travel plans with people, the first question they often asked was, “Are you taking the baby?” Of course we were taking Little One! First of all, we’re obsessed with him. Literally obsessed and infatuated. We talk about every morsel he eats, comment on each laugh, and analyze the babbles that stream from his cute little mouth. I cannot imagine choosing to travel for two weeks without him. We would constantly be thinking and worrying about him. Besides, we love spending time with him. One of the things we were most excited about on this trip was spending two weeks entirely together. Ben wouldn’t have to leave early for work and return only an hour before Little One’s bedtime. I wouldn’t have to hand Little One over to his babysitter. We would have unlimited family time, and Ben and I would have unlimited co-parenting time, sharing responsibilities, as well as the magical moments and challenges that each day brings. We never chose to travel with Little One. There was no other option for us. We love to travel, and we always planned to continue traveling once we welcomed a child into our lives. Little One simply made us rethink our travel strategies, forcing us to make our travels smoother, less hectic, and somewhat more expensive, and it was absolutely worth it! We dug the baby-friendly street art in Valparaiso — and all the other street art, too. Have you traveled with a baby? Share your experiences here! Hello, would you mind sharing your itinerary? We plan on going to Chile with our 7 month old this year and are very nervous. My itinerary is below. Please keep in mind that we stayed in WAY too many Airbnbs. If I were to visit again, I’d stay in 2 Airbnbs at most and take day trips. Valparaiso is AMAZING! Put your baby in a carrier and explore it. Let me know if you have any questions at all. I’m excited for you guys! Thanks for sharing this! I’m curious – did you bring a stroller with you? I’ve heard in Valparaiso, it’s not worth it due to the uneven sidewalks/streets, but how about elsewhere (Santiago, Puerto Natales, etc.)? Just trying to decide if it’s worth lugging it along, or if the baby carrier is sufficient. 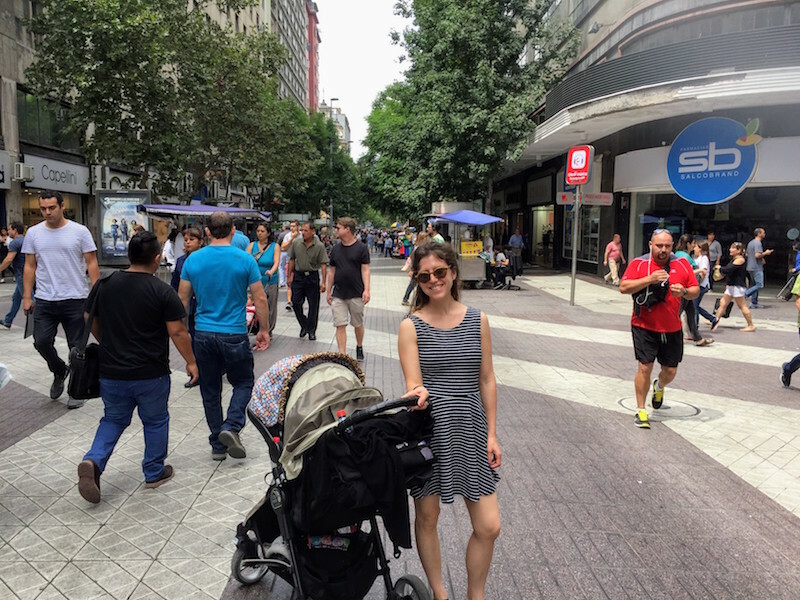 We did bring a stroller, but we mostly used it in Santiago. Our son really lived in the carrier during that trip — and he was happy to — and we definitely didn’t need a stroller. We especially didn’t need a City Mini, which is much bigger than it pretends to be. The endless staircases are what makes using a stroller in Valparaiso especially hard. I am so happy that we traveled there with our son before he was walking and while he was still totally happy spending most of his time in a carrier. Valparaiso is the most stunning city I’ve ever visited. Each day, my heart exploded from joy. Since that trip and since our son stopped using a carrier, we’ve wisened up and have traveled domestically and internationally with a 2 lb and $30 umbrella stroller. It has absolutely no frills, but it serves its purpose :). Let me know if you have any other questions!